I enjoyed my cruise. It was relaxing and fun. I liked the fact that we had ports of call and the time spent at each was just enough. If you are looking for something very very quiet. This is a good one for you. No frills. Nothing like Carnival or Royal Caribbean. Not even a free rum punch on the first day. Happy hour consisted of buy one at regular price, get $2 off the next. The cruise was wonderful. We were blessed with perfect weather. I would encourage all guests to double-check their stateroom charges before disembarkation. Many of us had incorrect charges, such as mini-bar items that we did not use. Holland America did take care of the errors before disembarkation, but there was quite a line. The weather was excellent. The excursions were all done well. We were not rushed on any of them that we did. The service was excellent across the board. Service aboard the Zuiderdam was very disappointing. Ship itself was nice. I have taken over 14 cruises over my life and this cruise and ship was the greatest disappointment to me and my wife. Some of the cruise lines we have been on are: Regent Seven Seas, Radisson before it was bought by Regent, Carnival, NCL, Chandris Lines, Cunard, Disney Cruise Lines, and Holland America. I am nearing retirement and my wife and I will be planing 30 and 40 plus day cruises and even a 1/2 year cruises and Do not know if I will put Holland America in the hat. But I must say that the size and layout of our room 8082 0n the Zuidurdam was excellent for a long term cruise. The Overall Rating you assigned me below is wrong, I wuld rate this cruise as a 2! Not 3.6. Great itinerary. Neptune suite is pricey but is well appointed with terrific service from stewards, laundry included and access to Neptune Lounge with concierge services. Service in main dining room was friendly and attentive to individual needs. Food quality was excellent. Highly recommend the Pinnacle Grill steak and seafood specialty restaurant. Outstanding food and service. Captain on this ship was very accessible to guests. Entertainment was good especially B B Kings Blues Club and Billboard on Board. Shows were good overall especially the ship's singers and dancers, the individual acts only fair. great time. would recommend this trip to anyone. Holland America is great for multi-generational and or older groups and is very nice without being overly priced or over run by singles and kids. On and off was easy and fast, very well coordinated to minimize wait times. Nice trip with the grandchildren. Islands didn't offer too much for us but grandchildren did their own thing such as scuba, snorkeling and beach work. We had some good tours. The sub to the ocean floor was great. We also did sightseeing trips giving us an overview. Excursions were expensive. I wouldn't recommend this trip to anyone. One section especially the last portion was enough. Virgin Island was the best island. 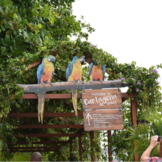 After awhile the islands all look the same with the vendors selling the same things. Too much advertising for jewelry. Internet was expensive on the ship. Bed was terrible. Room as good. Food was OK.
Holland America is great for multi-generational and or older groups and is very nice without being overly priced or over run by single and kids. great experience, except in the dining experience as a vegetarian. They always get the special order wrong and I was server the same dinner 3 days in a row even though I ordered something differedt. At disembarkmetn I ended up with a broken suitcase handle and a cut finger as a result. Also a bottle of liquor broke because it was not padded properly in the hand carried box. Big diasppointment with the packaging at the duty free store. They need to have bubble wrap instead of paper bags. Please advise who will pay of the broken sitcase handle. Staff great, ship clean, food good, shore excursions horrible. The number of days at sea combined with onboard activities bored m3 to tears. 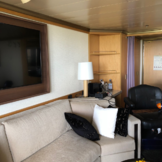 If reading books or watching movies on your stateroom tv is not your favorite pastime, this cruise is not for you. Panama canal (partial transit) great views and opportunity to relax and unwind. Neptune Suite is a MUST. HAL remains thoughtful in their approach even if execution is a tad problematic sometimes. Would recommend to folks who want a very low key relaxing trip. 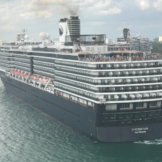 If you choose to follow Zuiderdam you will receive weekly email updates with the latest reviews, tips, and photos from Cruiseline.com members about Zuiderdam.